The importance of the role of language in teacher education programmes and in children's learning is crucial. This study focuses on the use of English as the language of learning and teaching and its impact on the language development of English second language (ESL) student teachers and ESL learners. Against the background of major theories in second language (L2) acquisition and learning, this topic is contextualized within the South African education system. An empirical inquiry was carried out in which portfolios (evidence of practical teaching including lesson plans and learners' work) submitted by final year student teachers enrolled at a large distance teaching university for the Advanced Certificate in Education: Inclusive Education were scrutinised. A comparison of teacher and learner written errors was made. Based on the findings, a questionnaire was designed to determine the extent of the impact of teachers' limited English proficiency on learners' English proficiency. The findings of the questionnaire responses are presented. Recommendations are made on how student teachers can improve their teaching practice to ensure quality ESL teacher input and ESL learner performance. The transition which English second language (ESL) students need to make when using English as language of learning in higher education is a matter of great concern in the South African higher education sector. Chiwome and Tondlana (1992:248) postulate that non-English speaking students who are African mother-tongue speakers prefer to be taught in English, particularly at university, even though it takes longer to learn in the second language (L2) than in the mother tongue. According to Kapp (2004:260-261), these students are often labelled as at risk or disadvantaged as a result of the linguistic, cognitive and social transition they have to make when entering higher education where most teaching staff are white (although this is changing rapidly) and proficient in English. In particular, this paper focuses on the limited English proficiency of final year student teachers enrolled for the Advanced Certificate in Education (ACE): Inclusive Education at the University of South Africa (Unisa). These students are practising teachers who teach ESL learners and their own language proficiency influences the learners' English language acquisition and academic progress. Emanating from this concern is the alarmingly low pass rate in the ACE: Inclusive Education programme as reflected in recent statistics: a pass rate of 49.58% in 2006; a pass rate of 47.86% in 2007 and a pass rate of 44.39% in 2008 (Directorate Student Assessment Administration, Unisa). The Progress in International Reading Literacy Study (PIRLS) of 2006 is an international study of reading literacy which is conducted every five years and 40 countries participated, including South Africa. Approximately 30,000 Grade 4 and 5 learners were assessed and alarming findings were reported, namely, that South Africa's Grade 4 and 5 learners achieved the lowest mean scores compared to the other participating countries (Pirls 2006). Fleisch (2008:105-112; 130) states that shifting from mother-tongue instruction in reading, writing and numeracy in the first two to three years of schooling to a second language (L2) in Grade 4, where the learner is expected be proficient in reading across the curriculum, is problematic. These learners had a limited vocabulary of about 500 words and could read only simple 3-7 word sentences in the present tense (Fleisch 2008:130). According to Pretorius (2002: 191), at this stage these learners have barely mastered reading comprehension skills in the mother tongue let alone the L2. Other factors contributing to poor L2 acquisition and academic achievement in township schools and rural areas are: lack of access to newspapers, magazines, TV and radio; lack of opportunity to hear or to speak English; lack of English reading material at home and at school; and poor language teaching by teachers whose own English proficiency is limited. Pretorius (2002:172-173; 187) argues that poor matriculation pass rates in South Africa suggest a reading-to-learn barrier to academic performance which results in poorly equipped students entering higher education institutions. Students in higher education institutions are expected to access information from print independently, to construct meaning and to reconstruct new knowledge. Pretorius and Machet (2004:58) refer to the "paradox of the primary school professional", referring to teachers of literacy who are themselves unskilled and do not read due to a strong oral culture and lack of reading materials. Chomsky (in Mitchell & Myles, 2004:94) explains that the logical problem of language learning is caused by messy and fragmentary input, making abstract concepts based on limited examples of languages. Gass (in Bailey, 2006:65) refers to input as "... the language to which the learner is exposed, either orally or visually ...", in other words, the language which "surrounds learners living in a L2 environment". In the context of this paper, teachers are responsible for an inadequate language input due to their own limited English proficiency. Further, one of the most pertinent theories informing this study is that of Krashen who found that the essential ingredient for L2 acquisition is comprehensible input through teacher talk. The teacher should talk on a learner's level of comprehension, that is, the learner should be able to understand what the teacher is saying (Richards & Lockhart, 1994:184). Transference from one speaker's use of language to another speaker's use of language can be viewed as a contamination factor in the use of the L2. Where teachers' own L2 knowledge is not on an acceptable standard for the use of English as the LoLT, their poor usage and knowledge of the language are transferred to the learners (Stander, 2001:108-110). Marinova-Todd (2003:61; 67; 70) concludes from reviewed studies that the availability and the access to good L2 input and instruction produce the best outcomes in L2 and ensure native-like proficiency. In addition, Mari-nova-Todd (2003) found that the sooner a learner is exposed to the L2 in an environment rich with L2 interaction and input, the more time a learner spends on a task and the longer the learner is resident in a L2-dominated environment are better predictors of L2 acquisition than age. Appropriate circumstances and quality instruction lead to native-like competence in L2 in younger and older learners. In addition, modeling is very effective, for example, using strategies to access meaning when reading. The teacher should model the strategies for which the learners eventually need to take responsibility. Frederickson and Cline (2002:441) explain that through modeling, the learner is provided with a step-by-step demonstration of what is required. According to Ellis (2002:24), social factors affect the L2 proficiency attained by different groups of learners. During submersion L2 learners are taught in a class where L1 speakers are dominant; during immersion L1 learners are taught through the medium of L2 by bilingual teachers in classes where there are only such learners. August and Hakuta (in Lapp, Flood, Moore & Nichols 2005:159) explain that during English immersion English language learners (ELL) are immersed completely into the English contexts without any support in their home language. The aim of immersing learners into English contexts is to develop their English language and literacy skills. The reality is, however, extremely difficult for an ELL to learn a new language while simultaneously acquiring literacy in the L2 and not receiving support in their home language. In South Africa, the tempo and complexity of educational change and the limitations of pre-service education call for intensive in-service training programmes for teachers (Bagwandeen & Louw, 1993:8). Teachers' practical knowledge base is gained when it is grounded in theory and principles and informed by a knowledge base of effective language and content teaching appropriate to the stage of a programme and the teachers' development (Cloud, 2005:279-280). Hence, Unisa (2006) has responded by developing a language policy in line with the language policy for Higher Education (Unisa, 2002). Functional multilingualism is adhered to in order to accommodate linguistic diversity. The policy also recognises that the students have the right to receive their education in the official language of their choice. Where students receive tuition in a language other than their home language, the university undertakes to support first-year students by assisting them in upgrading their cognitive academic language skills. The research was guided and supported by the theoretical foundation and the conceptual framework in the literature study. The study necessitated the collection of both qualitative and quantitative data resulting in a mixed model research design. The analysis of student portfolios comprised the qualitative component of the design and a survey the quantitative component. Creswell's (in De Vos, 2002:366) "dominant-less-dominant model" was used, whereby a small component was drawn from the alternative paradigm (qualitative) and included in the dominant paradigm, namely, the quantitative paradigm. In this case, the component from the qualitative paradigm comprised examples of learner and teacher language errors reflected in the teachers' portfolios and which was used as a triangulation method to substantiate the findings in the quantitative component of the study. It also served to answer the "How" part of the research question. How and to what extent does the English language proficiency of teacher training students enrolled for an Advanced Certificate in Education: Inclusive Education at Unisa affect the ESL learners whom they are tutoring, or intend to tutor, on completion of the course?  Final assessment of learners' written work during the eight support lessons. The researcher examined the contents of the portfolios to identify the teachers' written errors as well as the learners' written errors. These errors were compared and analysed to determine to what extent the teachers' language transference influenced their learners' written language. After the seventeenth portfolio, a general tendency of language errors was noted and a saturation point was reached in the sense that continued probing into the portfolios did not add any additional value to the data already collected. Based on the data collected, the researcher followed the same route as described by Stander (2001:110-111) who identified substantial similarities in portfolios which led to the conclusion that teachers' L2 forms are transferred to their ESL learners' language forms and reflect the teachers' poor English language proficiency. Together with an expert from the Department of English at Unisa, the researcher was able to identify and categorize errors made by the learners and the teachers and to match similarities in errors made by learners and student teachers. 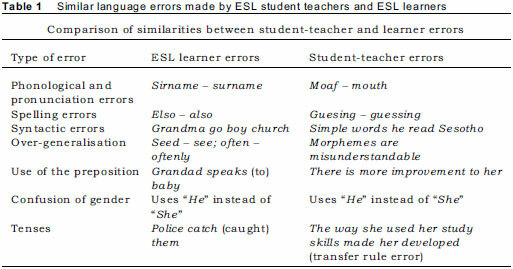 The error categories and error comparison between student-teacher and learners are presented in a few examples in Table 1. Findings of the qualitative analysis indicated that teachers made basic errors such as grammatical errors, incorrect use of tenses, concord and spelling errors. This was generally applicable to all the teachers. The influence of L1 on L2 learning was evident in these examples. 1. Phonological errors occur when L2 learners are taught by L2 teachers, in the sense that incorrect sound, stress and intonation patterns as well as faulty pronunciation are transferred to the L1 (English language). 2. Spelling errors are modelled by L2 teachers and L2 learners learn the incorrect spelling. 3. L1 transfer takes place on a syntactic level (modelled by the teacher), for example, verb tenses in English such as the overuse of the progressive verb tense. 4. Over generalisation as a result of intra lingual transfer (modelled by the teacher) where a rule is applied in L2 where it is unnecessary. 5. Grammatical error (omission error), such as the omission of the infinitive form, occur. For a Sepedi speaker, for example, the use of prepositions is a problem. (In the Sepedi language prepositions do not exist). 6. In the isiZulu language there are no equivalent gender-words for "she" or "he" and this leads to confusion with regard to gender such as he is used in place of she. 7. The teacher does not know the past participle which should be used with the past perfect and present perfect tense and uses the past tense form of the verb instead. For example: One of them has went home. Because the action has taken place, the past tense is used - a typical error made by someone who has not mastered the third person singular that is used for the past; the person could also be confusing the subject of the sentence as being 'them' and not 'one'. The findings of the qualitative component informed the design of a questionnaire in the quantitative component of the research. The questionnaire, which is described in the next section, served to address the question of the extent to which language proficiency of teachers enrolled in the ACE course affected the ESL learners whom they teach or intend to tutor in the future. 1. To explore the influence of teachers' limited English proficiency on their ESL learners (addressed in the qualitative component). 2. To establish to what extent identified factors - which feature in the various sections of the questionnaire - contribute to the teachers' limited English proficiency affecting their learners' acquisition of L2 and their learning (the quantitative component of the research design). 3. To recommend possible intervention strategies to support these teachers in teaching their learners more effectively. Relevant information on student teachers' language proficiency for the study was collected via a questionnaire designed for the purpose. The questionnaire consisted of five sections, including: Section 1 elicited information about the school environment where the student teacher was teaching and ESL learners' daily exposure to English, both within and out of the school context (11 questions); Section 2 elicited information regarding resources at the school (10 questions). Section 3 elicited information about the languages used at the school by both the learners and the teaching staff (9 multiple choice questions); Section 4 elicited information about the student teacher's work environment at school (4 sections of questionnaire items); and Section 5 probed information on the ESL learners in the student teachers' classes (4 closed and 5 open-ended questions). A total of 800 questionnaires were mailed to 400 student teachers enrolled at Unisa for the ACE: Inclusive Education in 2008 and 400 teachers enrolled for the same course in 2009 (N = 800). Inclusion criteria for the sample were participants in their final year of ACE: Inclusive Education, whose home language was an African language and who were teaching ESL learners. One hundred and ninety-nine completed questionnaires were returned, resulting in a response rate of 24.9%. Sampling was therefore regarded as convenience sampling since all returned questionnaires were included in the sample. Since the majority of responses data collected proved to be categorical in nature, a non-parametric analysis strategy was followed in which descriptive statistics, such as means and standard deviations, one-way and composite one-way frequency tables were calculated on all questionnaire item responses probed in the five sections of the questionnaire. Two-way frequency tables were also calculated and Pearson's Chi-square tests (and Cochran Armitage trend tests) performed on the frequencies of cross referenced item-responses to investigate the possibility of significant relationships between specific pairs of questionnaire items. The deductions derived from the frequency tables are discussed and associated frequencies presented as percentages of the totals. All statistical analyses were conducted with the statistical software package referred to as SAS, version 9.1 (Statistical Analysis System). The biographical information collected in section 1 of the survey questionnaire gave researchers a general indication of the target learner population that was being taught - and influenced - by the sampled student teacher population. The data revealed that by far the majority of student-teachers (94%) indicated that they were involved in primary phase education up to Grade 7. Eighty percent of the respondents reported that they had a language policy in place at their respective schools. The age bracket of the majority of learners tutored by the respondents (79%) was between 6 and 11 years. The frequencies on age corresponded closely with the frequencies on age-related grades which the student-teachers indicated that they taught. Fifty-eight percent of the respondents indicated that they resided in rural areas. With regard to the school environment, which was also queried in section 1 of the questionnaire, student teachers indicated that the enrolment figures at these schools varied between 50 and 1,999 (with an average of 730 students per school) and the number of learners per class varied between 6 to 99 (with an average of 42 learners per class). In addition, the number of ESL-learners per class varied between 1 and 99, with an average of 29 ESL learners per class. Exploratory statistics indicated that the standard deviations for enrolment, class size and number of ESL learners per class were relatively large, indicating that enrolment numbers, ESL learners and number of learners per class varied considerably. The learner population that was most often taught by the student-teachers in the study can therefore be described as younger learners in rural areas attending government schools where teachers (student-teachers) often had to cope in overcrowded classes. Section 3 of the questionnaire queried the language status of learners, student-teachers, LoLT, language policy of schools and informal exposure of learners to the English language (section 1). Since South Africa has 11 official languages and student-teachers and learners reflect the whole language spread, all the languages were included as options in the relevant language questions of section 3. 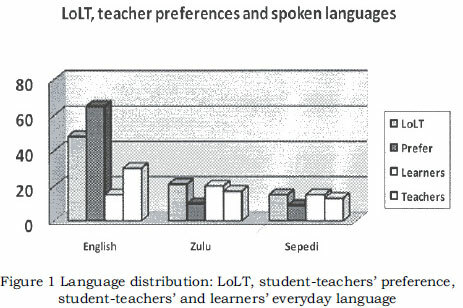 The frequency distributions on language indicated that the LoLT in the schools where respondents taught was mainly English (48%), followed by Zulu (21%) and Sepedi (15%). On the other hand, the student-teachers themselves indicated that their preferred language of communication at school and in the classroom was English (65%), followed by Zulu (10%) and Sepedi (9%). In 59% of the cases, student respondents indicated that all teachers at their schools were proficient in English and that 87% of the student teachers regarded themselves as proficient in English. The frequency distribution of languages most often spoken by learners revealed that most learners spoke Zulu (20%), English (15%) and Sepedi (14%). Another eight languages were also indicated by learners. The student teachers themselves indicated that in their everyday life they primarily spoke English, (30%), Zulu (17%) and Sepedi (13%). Fifty-nine percent of respondents indicated that all teachers at their schools were English proficient and 87% regarded themselves as proficient in English. A comparison of language use required by LoLT, student-teacher classroom preference, and, languages spoken by learners and student teachers are depicted in Figure 1. According to Figure 1 it appears that the LoLT does not closely reflect language use in everyday situations. The deduction is substantiated by results related to respondents' daily chores. These items probed respondents' preferred language of communication when interacting with family, friends, colleagues, talking to their pets, shopping, etc. The frequency distribution on language preference under these circumstances indicated that English was mostly used by student-teachers to perform tasks related to work while Zulu and Sepedi were most often used to perform chores at home and in the community. An indication of informal English language support at home for L2 learners was derived from frequency figures on television viewing. Sixty-five percent of the learners indicated that they watched television regularly at home. In contrast the percentage of learners that had English literature at home, and read it, amounted to 28%; while the percentage of learners that spoke English at home was reported to be 8%. The deduction was made that apart from television, exposure to English outside of school was limited. The frequency distributions of section 4 of the questionnaire probed the ESL work environment of student-teachers and covered areas of perceived knowledge of ESL issues relating to learning and language development, content of learning areas, second language acquisition, cultural and linguistic aspects of learner tutoring, learner support and assessment. Results indicated that 66% of the respondents did not feel that they needed training in L2 use. They did, however, indicate that they often lacked the confidence to teach in English (56%); that they often were not familiar with the learners' mother tongue and traditions (61%); that they seldom arranged meetings with L1 speakers (61%); that they did not readily recognize differences between language barriers and 'content ignorance' (71%); and that they observed that learners mixed L1 and L2 (90%). 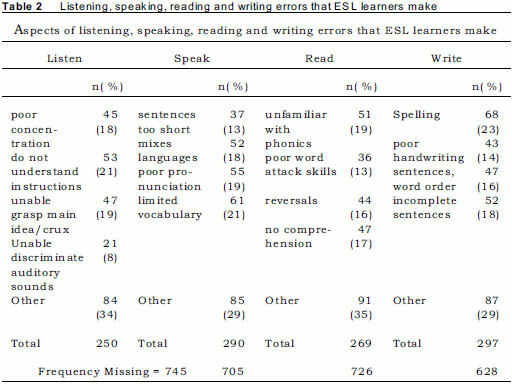 The frequency distributions on learner assistance indicated that respondents perceived that they assisted learners a lot on numerous ESL issues, which included conversing in English (93%), assistance with pronunciation (98%), listening skills (97%), reading skills (96%), spelling (96%), and learning methods (99%). Respondents perceived that they made provision for ESL learners while assessing their work. In this regard the majority of student teachers (64%) indicated that they did not assess all learners equally and that they assessed listening, reading, writing, and spoken skills individually (96%). Language proficiency was considered in the assessment process as well by 90% of the respondents. Analysis results also indicated that respondents perceived the purpose of assessment as a means of grouping learners according to performance, (indicated by 90% of the respondents); to measure progress and achievement (61%); to guide and improve instruction (99%) and to determine knowledge (91%). Section 5 of the questionnaire evaluated ESL learners' position in the classroom and frequency results indicated that student teachers perceived their learners to be eager to learn English (indicated by 78% of the respondents), that they had very limited L2 proficiency (23%) and that they needed support (82%). Most respondents felt the ACE programme course they had enrolled for had assisted them in tutoring L2 students (96%), guiding parents (84%), differentiating their way of instruction (89%) and to collaborating with colleagues on L2 issues (90%). Respondents indicated that they used code switching (54%) and that they encouraged learners to use English by sharing their everyday experiences in English (79%). Most respondents felt that their learners understood instructions given in English (85%) and they gave immediate language feedback (90%). Section 5 of the questionnaire also probed the problems that ESL learners encountered when reading, writing, listening or spelling English. The frequency of encountered problems is reported in Table 2. 1. Listening: learners did not understand instructions (21%). 2. Speaking: limited vocabulary (21% of learners). 3. Reading: learners were unfamiliar with phonics (19%). 4. Writing: learners had difficulty spelling (23%). Section 5 of the questionnaire lastly probed the difficulties that student teachers experienced within the school environment with regard to ESL support and tutoring. These included limited or no resources (reported by 66% of the respondents), limited funding (55%), and no ESL support (61%) from official channels. The results are reported in Table 3. The majority of the student-teachers in the sampled population were involved in rural primary school teaching where the learners were between the ages of 6 and 11 years. Statistics on the language issues covered in the questionnaire clearly indicated that the teachers' limited English proficiency affected their learners' acquisition of English as an L2 negatively and, subsequently, their learning. This was especially highlighted in the qualitative component of the research, where the results indicated that various forms of English language errors were transferred to learners. A dark picture regarding teacher and learner English language proficiency emerges if the findings of the qualitative study, in conjunction with those of the quantitative study, are set against the school environment in which student-teachers have to function and transfer knowledge. The quantitative findings indicated that the number of learners per class in the schools included in the study occasionally tallied 99. Lessing and Mahabeer (2007: 139-141) see class size as a grave concern. Class size burdens teachers, who have usually to tutor classes in which the proportion of ESL learner is high. Language acts as the basic communication channel for knowledge transfer and learning from the educator to the learner. If the knowledge communication channel is obscured and hindered by limited English proficiency - both on the side of the learner and of the teacher - knowledge transfer cannot be effective. Language issues that the (often) inexperienced student-teachers have to face include the LoLT of the school, dubious informal exposure of learners to English, student-teachers' perceptions of their own needs and proficiency in English, their perceptions of the level of support that they render to ESL learners, their perceptions regarding differentiated assessment of a diverse learner corps, and limited ESL resources availability. The quantitative research findings indicated that English was most often the LoLT and the language preferred by student-teachers, but findings indicated that the respondents' home language and that of their learners was mostly either Zulu or Sepedi. The figures indicated that the LoLT school policy and social language environment did not correspond. In conjunction with issues of poor knowledge transfer and English language acquisition, an implication of home language and LoLT discrepancy where young learners are involved, is that L1 and L2 are mixed. Fleisch (2008) and Pretorius (2002) feel strongly that shifting from mother-tongue instruction (in the first two to three years of schooling) to English as LoLT compounds the problem of language confusion as the learners have not yet mastered reading in their mother tongue, much less in English. The results of the study also raised a question as to the effectiveness of watching television as an informal exposure to English. In the study it was indicated that a large proportion of learners watched TV at home. It was, however, not indicated whether they watched English programmes or not. Results indicated that a small proportion of learners had English reading matter and that a small proportion spoke English at home. Pretorius (2002) explains that these limitations contribute to the poor English L2 acquisition. The quantitative results also suggest that student teachers' perceptions of their English proficiency, as expressed in the quantitative component of the study, should be revisited. Although the majority of the student-teachers indicated that they were proficient in English, had adequate knowledge of ESL issues and that they did not require ESL teacher training, they indicated that they lacked the confidence to teach in English. Evaluation of the portfolios of the student-teachers in the qualitative component of the study also verified the contradictory findings of the quantitative study: evidence of poor English language proficiency and language error transfer from teacher to learner was indicated. Student-teachers' perceptions (or misperceptions) of the value of their assistance rendered to ESL learners and their perceptions of their success rate in teaching their learners English, as established in the quantitative findings, seem to contradict the qualitative evidence found in the qualitative portfolio assessments. The quantitative findings indicated that respondents perceived that they accommodated ESL learners during assessment (using different assessment methods). This was however contradicted by the evidence found in the students' portfolios. The portfolio assessment revealed ill-defined aims and teaching methods; inconsistent marking of learners' work; complexity level of the work presented to the learners was inappropriate; written English language errors were presented itself and limited use was made of teaching aids. Quantitative findings on differentiated instruction indicated that student-teachers perceived their teaching of English to be successful because they supported the learners through differentiated instructions, collaborative teaching, code switching, immediate and correct feedback to their learners and allowed learners to share their everyday experiences through the medium of English. On the same topic student teachers however indicated learners did not understand instructions, that they had a limited English vocabulary, were unfamiliar with phonics and their spelling was poor. The negative picture which evolved from both the quantitative and qualitative components of the research has to be evaluated against the background of the barriers which the student-teachers indicated that they faced and which represent very real issues: limited ESL resources and support from colleagues, principals and other sources, and a limited time frame. Despite the poor situation in which teachers find themselves, Chiwome and Tondlana (1992:248) state that non-English speaking students who have African languages as first language prefer to be taught in English, particularly at university, even though it takes longer to learn in an L2. University entrance offers an escape from the township and the possibility of upward mobility. These students are often labelled as at risk/disadvantaged as they have to make a linguistic, cognitive and social transition when entering a university where the majority of academics are English speaking, making it far more challenging for these students (Kapp, 2004:260-261). Where learners switch to English at an early age and receive poor teaching, they develop basic interpersonal communication skills in English, but cognitive academic language skills are not developed. These skills are required in academic settings where they need to deal with difficult concepts and literacy. Considering the language barriers experienced by the teachers who participated in this study, the language policy of Unisa (2006) should be strictly adhered to by academic and administrative staff. Notwithstanding the idealistic goals of the policy such as functional multilingualism, accommodation of linguistic diversity and the right for students to receive their education in the language of their choice, the throughput rate of students is still alarmingly low. Where the policy makes provision for first-year students to be assisted by upgrading their cognitive academic language skills and by providing tuition through the medium of African languages, implementation of this should be accelerated. By implication, the Department of African Languages should facilitate the translation of course material into selected African languages. Richards (1993:3) says that L2 teacher training programmes usually include a knowledge base which includes linguistics and language learning theory, a practical component (based on language teaching methodology) and teaching practice opportunities. This calls for a re-look into teaching methodologies to determine gaps. Linguistics and L2 acquisition form the theoretical basis for the practical teaching and include "the study of pedagogical grammar, discourse analysis, second language acquisition, classroom-based research, inter-language syntax and phonology, curriculum and syllabus design and language testing". Therefore, lecturers in the School of Education at Unisa, and, in particular, those teaching the ACE, should integrate theory and relevant aspects of language teaching into the practical component to ensure effective language teaching. As Uys et al. (2007:77) conclude, one of the most important factors impacting on the improvement of academic literacy in South Africa is effective training in L2 for content subject teachers. This should also be put into practice by the English Department at Unisa, as suggested in the Unisa language policy (2006). A one-year short accredited course in inclusive education that is not as time-consuming or as rigorous as the ACE: Inclusive Education should be designed and implemented in the near future. Such a course could serve as a bridge into the ACE: Inclusive Education and will be more accessible to teachers in terms of cost, language and requirements. Such a course would have the advantage of offering teachers training in inclusion which includes the teaching of ESL using English as the LoLT. This course would be more comprehensive and systematic than attending short courses on an ad hoc basis. Such a course should also include ways of supporting ESL learners. Teachers could achieve university credits with this course; yet the course would not be on the same level of difficulty as the ACE: Inclusive Education. Ball (2003:212) in her study concluded that the course she designed to facilitate the development of teachers, who were committed to teach culturally and linguistically diverse learners, helped to change their perceptions of literacy and teaching diverse learners. Teachers' meta-cognitive awareness, reflection, introspection and critiques improved and helped them to develop action plans. This author demonstrates in her study how educational plans of teachers are influenced by their ideological stances and through their participation in a teacher education programme, their classroom practices will also change. Therefore it is necessary in the South African context to improve mother-tongue and English as a medium of instruction (EMOI) education (Banda in Fleisch, 2008:107). Teachers who have access to computers should be encouraged to use the My Unisa online facility to communicate with the lecturer and fellow students, to receive feedback about ideas, to obtain answers to queries and to share successes and challenges. The lecturer should create a space on the website where teachers who are registered students can log in. The lecturer should place an introductory letter on the website explaining how to use the facility and to initiate the discussions. Areas of commonality can be detected and students will be able to group themselves according to shared interests and concerns. They will also be able to interact with learning materials and lecturers. A 'one size fits all' approach to the continuous professional development of teachers to equip them for teaching in this kind of environment is not effective. A variety of models, each meeting different needs and circumstances, is required so that professional development for inclusive education, which includes teaching and learning through English as LoLT, can be realised. Rigorous evaluation to ensure a high standard of training interventions and follow-up support are required to ensure the practical application of knowledge, skills and attitudes in classrooms. This calls for an analysis of the needs of the student-teachers by using a language assessment instrument which measures their language proficiency in their L1 and in L2 (in this case English) at entry level as well as their language knowledge and linguistic skills (academic language proficiency) needed to cope with their learning tasks. It will also help to design course materials that will facilitate the transition to English. Thus, South African learners, including those who experience language as a barrier to learning and development, can be assured of quality teaching and learning in their classrooms. We thank Mrs N Zindela (Department of English Studies, Unisa) for interpreting the language error analysis of learners and student-teachers. Norma Nel is Senior Lecturer in the Department of Further Teacher Education at the University of South Africa. She has 8 years lecturing experience and her research interests are in inclusive education, barriers to learning, English second language, and learner support. Heléne Müller is Senior Research Support Consultant in the Research Directorate at the University of South Africa. She has extensive experience in the field of research design and analysis, particularly pertaining to further teacher training.